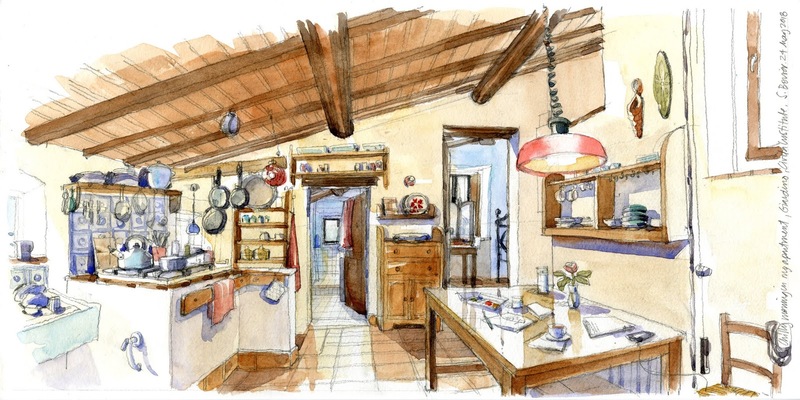 Good sketches start with Good Bones! In this workshop, you’ll learn the simple steps to set up the foundations of a great architectural sketch in Perspective and Watercolor. 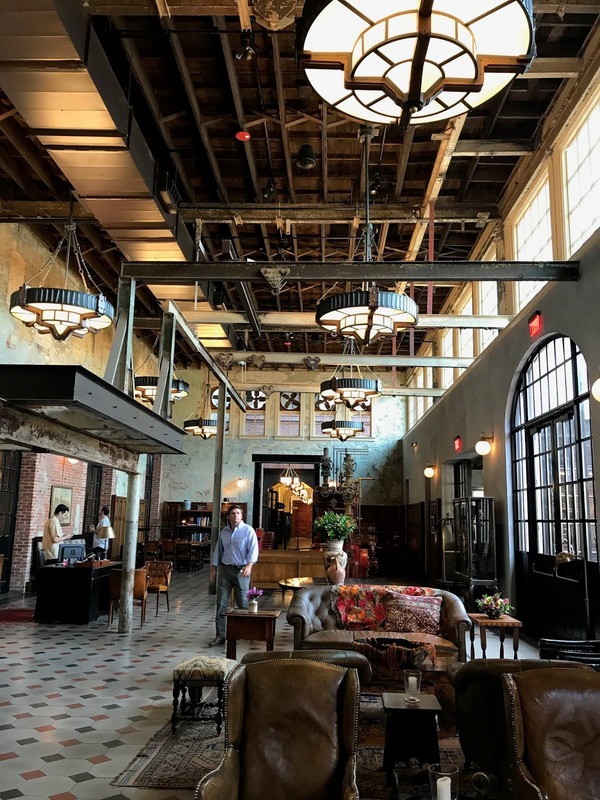 How do you start a location sketch? Where is the darn Vanishing Point? Watercolor is too overwhelming! Held in the amazing historic PEARL DISTRICT along the Riverwalk, this workshop offers 2 full days of instruction. The first day is devoted to learning the fundamentals of on-location perspective through demos and sketching on-site. Day two introduces basic watercolor mixing and techniques. Day 3 is a half day that puts it all together in an open sketch meet up! · Learn perspective basics and a simple step-by-step process to construct an architectural perspective sketch, how to build the sketch in layers. 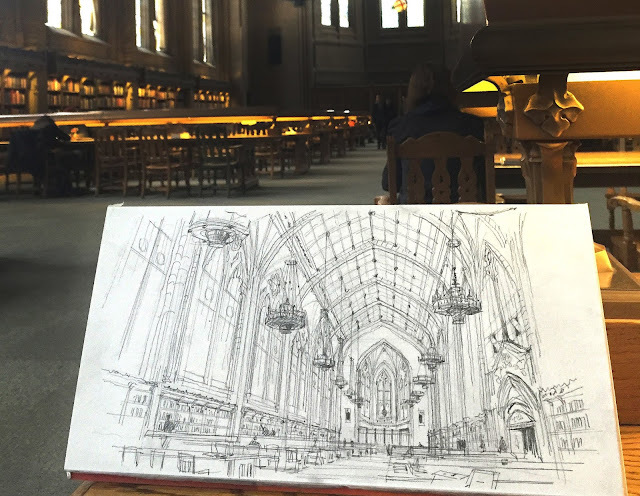 · Learn what to look for when sketching perspective on location—how to find your eye level and vanishing points to provide the good bones of any sketch. 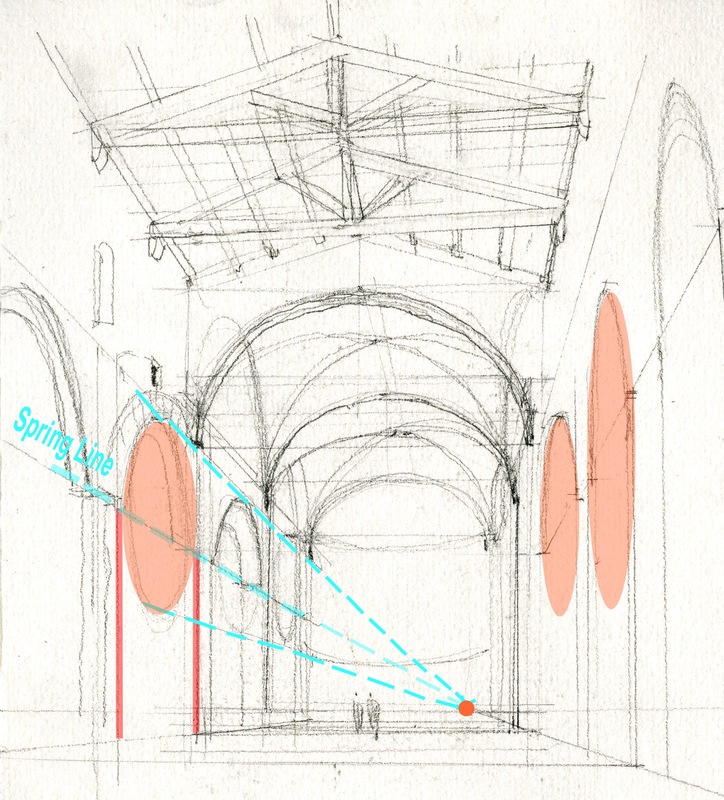 · Learn how to measure proportions and relationships of spatial elements. 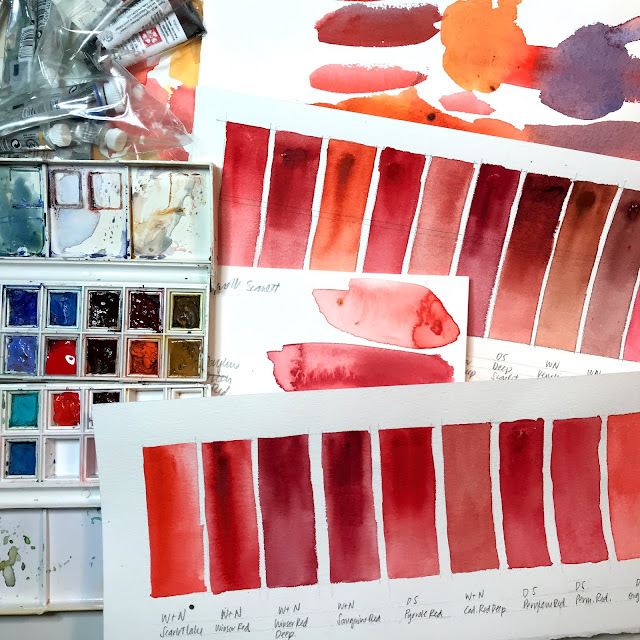 · Introduction to basic watercolor tools and techniques, using a simple palette of colors. 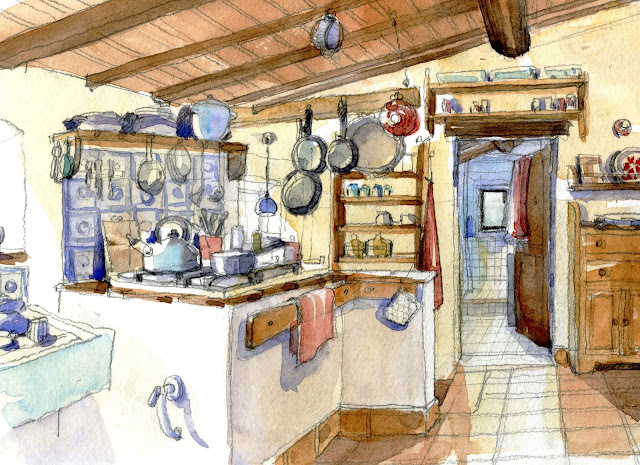 · Learn how to use watercolor to enhance the sense of architecture and space in your sketches. · In the afternoon, put perspective and watercolor together. * One hour break for lunch. GOOD BONES Day 3 | OPEN SKETCHCRAWL | Sunday, April 7 | 10am – 12:30pm Anyone can join us! 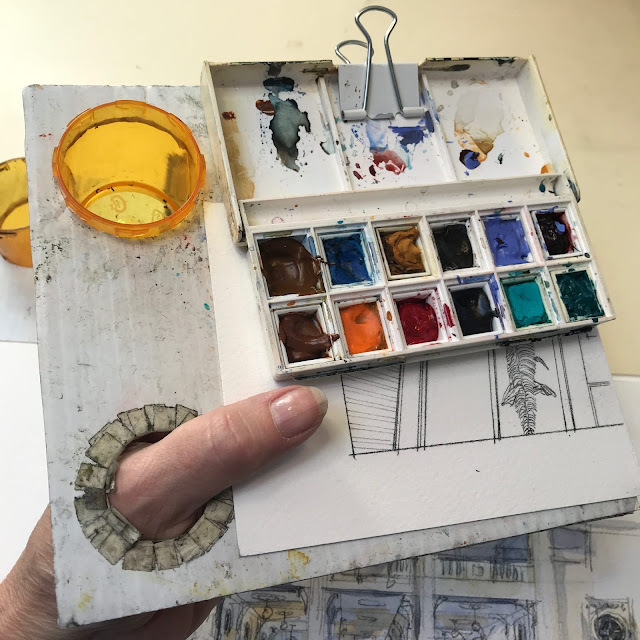 · An important half day to cement what you’ve learned, joined by other sketchers. 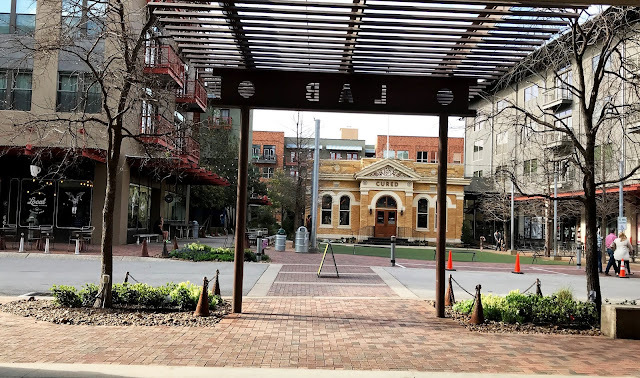 GOOD BONES SAN ANTONIO is open to 15 participants with any level of experience, but it’s targeted to sketchers who want to improve their basic sketching and understanding of perspective and watercolor. Workshop Registration opens SUNDAY, February 3, 2019 at 12noon central time. To sign up, contact Stephanie by email at stbower@comcast.net The first 15 emails will be accepted—first come, first served. 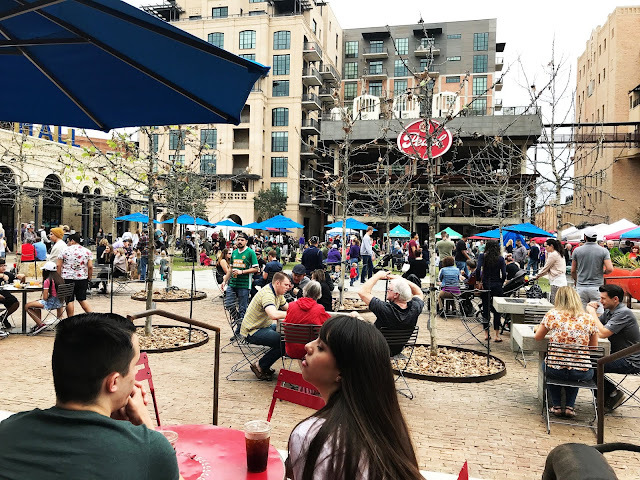 A waiting list will be created in case spots open up. Workshop fee is $230.00 payable by check once you are notified via email of a confirmed spot in the workshop. By March 1, all fees reimbursed; By March 14, 50% of fee reimbursed; After March 14, 10% of workshop fee reimbursed. A materials supply list and additional information will be emailed to registered participants. 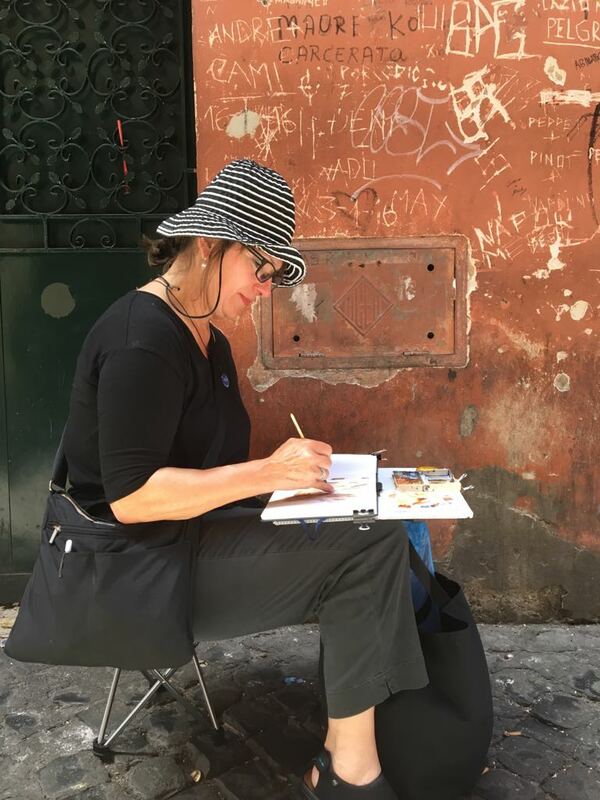 Workshop Instructor, STEPHANIE BOWER is an award-winning Seattle USA- based architectural illustrator, teacher, author, watercolor painter, and traveling Urban Sketchers correspondent. 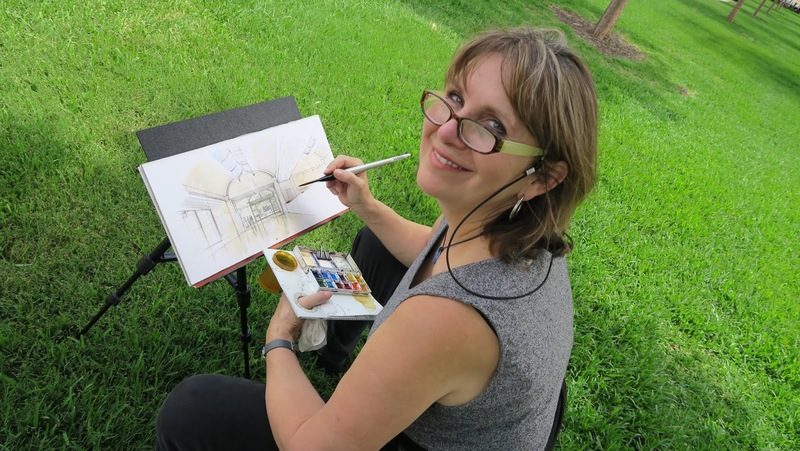 Stephanie’s sketching workshops bring together her professional career as an architect and architectural illustrator, her many years of teaching in colleges and universities in NYC and Seattle, and her love of traveling and sketching on location. 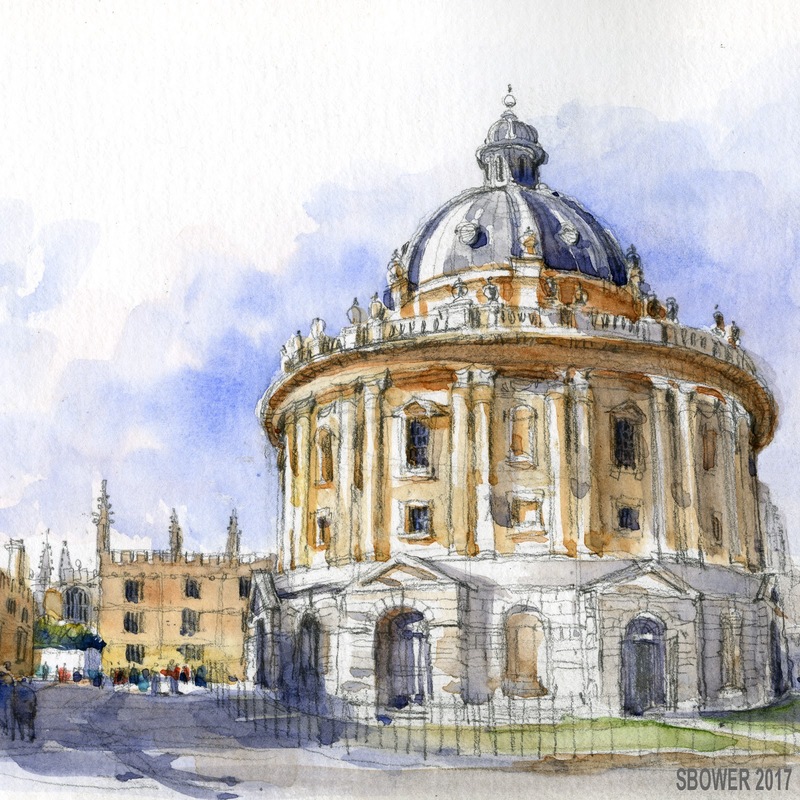 She was the recipient of the 2013 Gabriel Prize fellowship in Paris and was twice awarded the AIA Dallas KRob delineation competition for Best Travel Sketch. 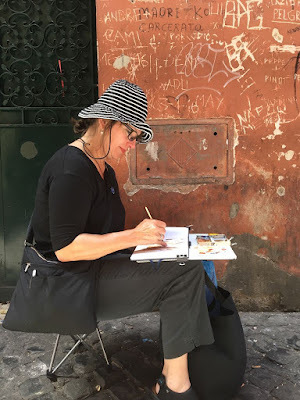 She is a blog correspondent for the Urban Sketchers www.urbansketchers.org and has taught at the international symposiums in Brazil, Singapore, Manchester UK, Chicago, Taiwan, and Amsterdam 2019, as well as workshops/demos in Australia, Oxford UK, Mumbai, Spain, and an annual workshop in Italy. You can also find her two online classes at www.Bluprint.com. 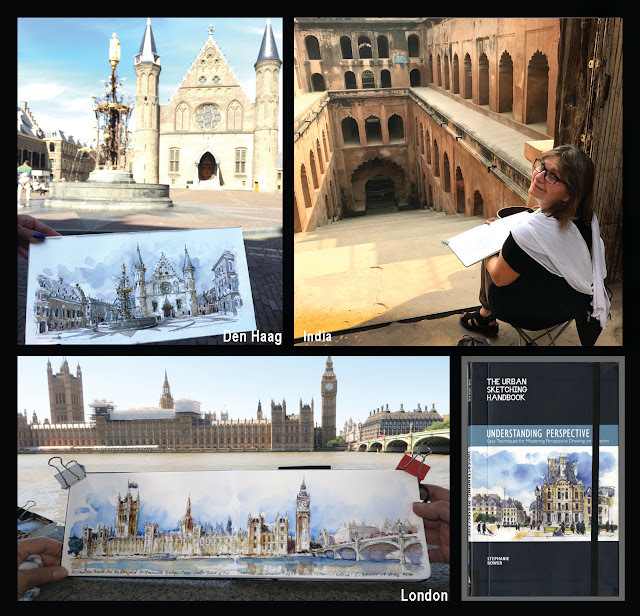 In addition, Stephanie is the author of the fourth book in the popular Urban Sketching Handbook series, Understanding Perspective and is working on another book due to be published in late 2019. For more on Stephanie’s work and workshops, go to www.stephaniebower.com. This workshop is in a FABULOUS location! The Pearl District in San Antonio is one of the best urban spaces in the country. 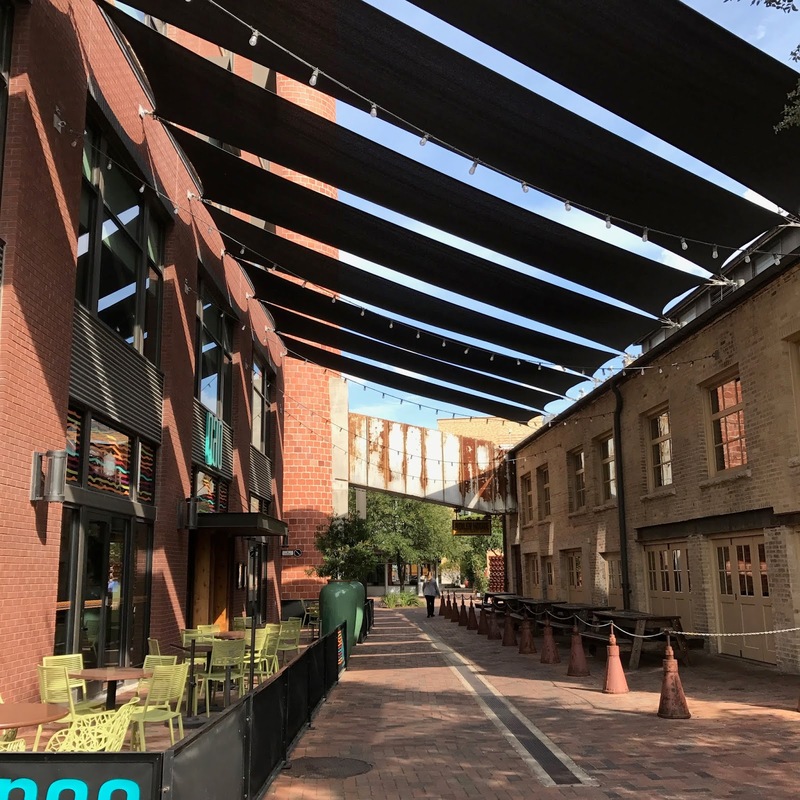 Beautiful renovated old buildings, farmer's market, cafes and shops, interesting architecture, all along the glorious San Antonio Riverwalk. I hope you can join me!! 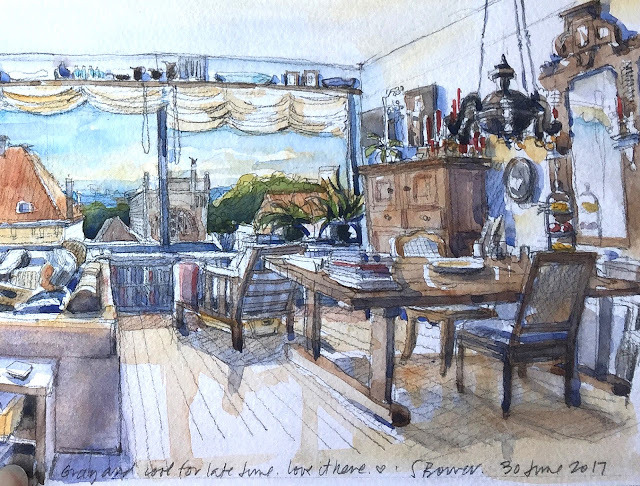 I'm thinking ahead to this summer's Urban Sketching Symposium in Amsterdam! Registration starts bright and early February 2, info is here. There are so many amazing workshops planned, I am truly honored to be a part of the incredible line up of instructors. I'll be teaching a workshop called "Towers are Like Wedding Cakes, and other "Ah-Ha" Moments", featuring some tips and tricks that have inspired a new book I'm working on! I love to teach perspective because it's something so many people fear, ignore, or fake, but there is no need if you understand a few simple principals. I hope you found this helpful...see you in Amsterdam at the Symposium ! 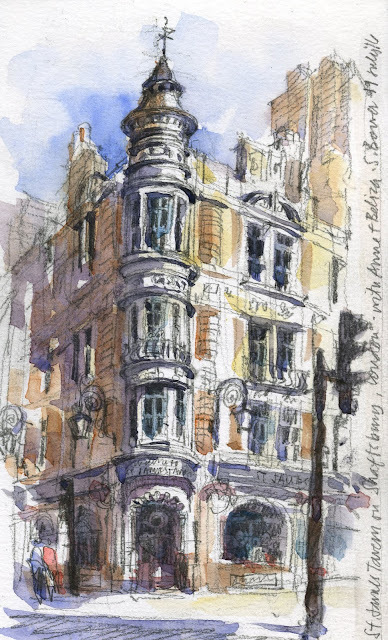 Urban Sketchers Symposium 2019 in Amsterdam!!! And what a great year it will be! 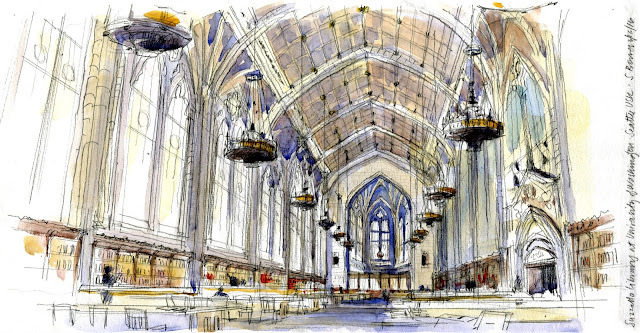 Just announced, this year will be the 10th Annual global Urban Sketchers Symposium. 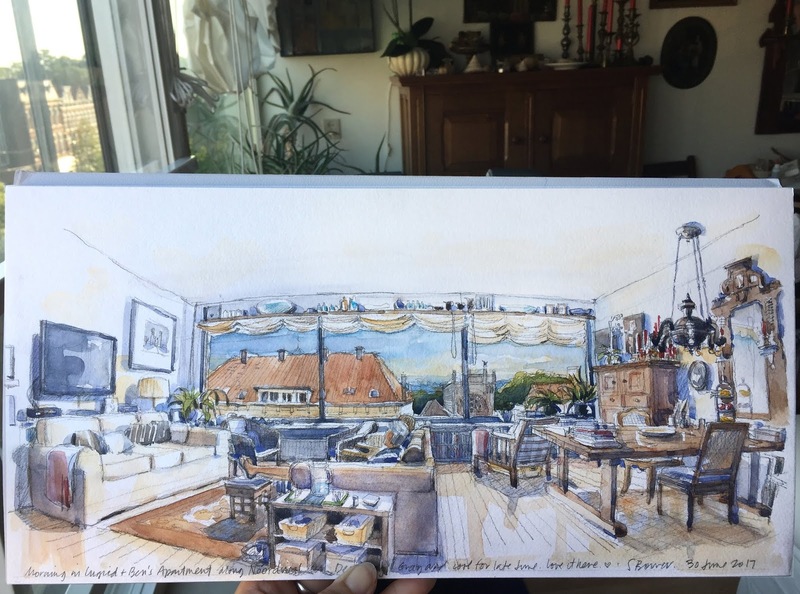 It's an amazing event to attend, as there is sketching going on 24/7, talented people from around the world to meet and sketch with, and of course the opportunity to sketch in beautiful Amsterdam. 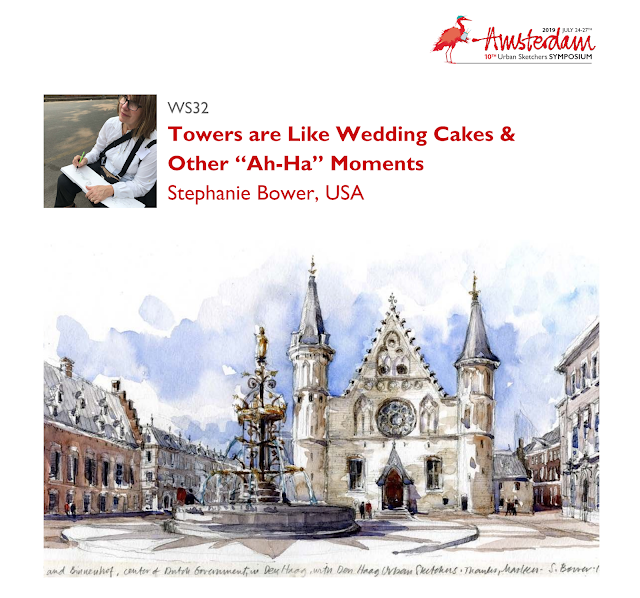 "did you know that towers are like wedding cakes, stairs are like wedges of cheese, and arches are definitely not horseshoes? Some of my favorite and fun sketching “ah-ha” moments have to do with relating architecture in perspective to other things we see and experience every day. I often use these concepts when teaching, as these metaphors can help us to demystify some of the complex forms we see in order to understand and draw them better...and it will be easier and more fun!" Registration for the symposium opens up February 2. Set up your account at Eventbrite now, then be ready. Set your alarm and register the second online registration opens! In addition to the symposium, there is so much going on... an insane amount of day job illustration work, nights and weekends spent working on a new book to come out in the Fall (yay! 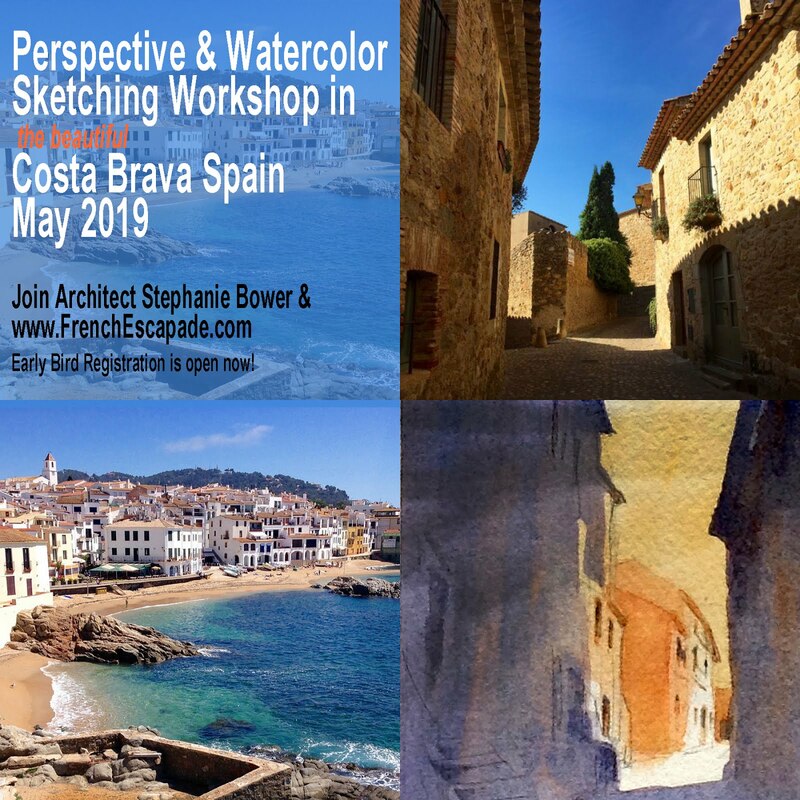 ), workshops in Spain in May (spots are still available in Session One), Draw Civita Workshop in June (full, but there is always next year)...whew. Here is wishing everyone a wonderful, creative, happy and healthy 2019! CHEERS! Sketching at the Kimbell Art Museum in Fort Worth, TX. 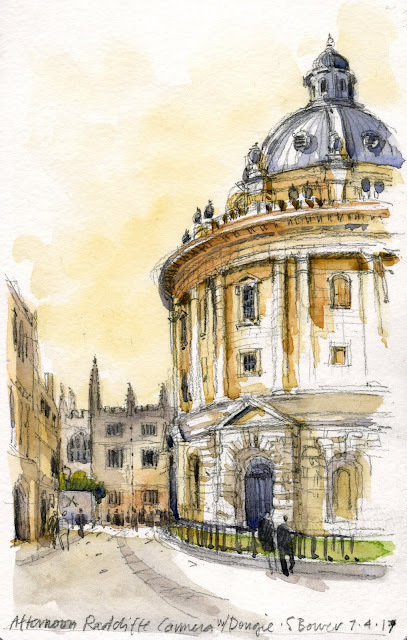 Urban Sketchers are such creative people! 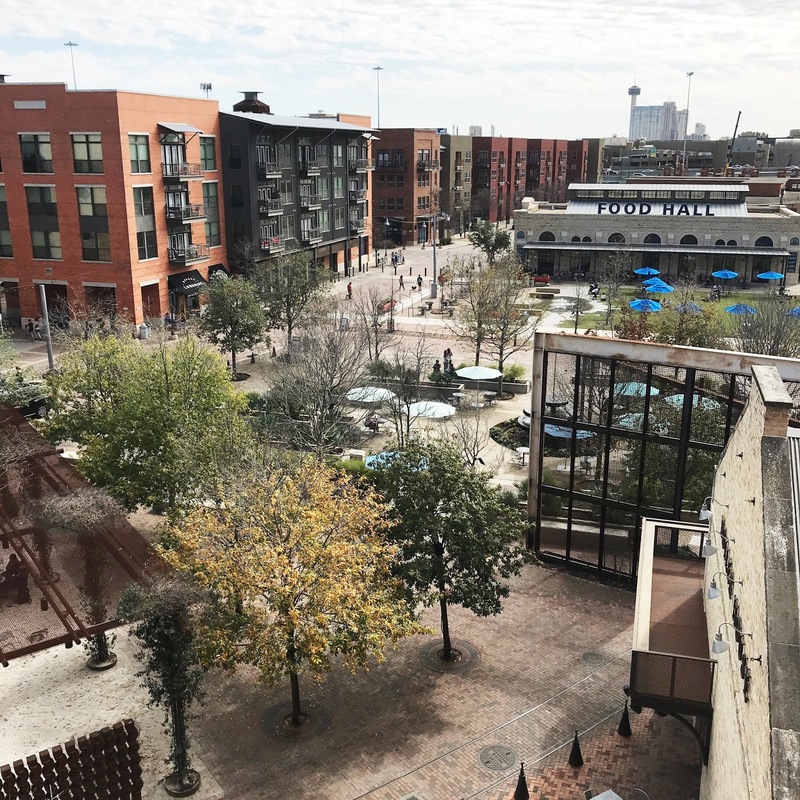 We figure out all kinds of workarounds and tools to make location sketching easier and better! 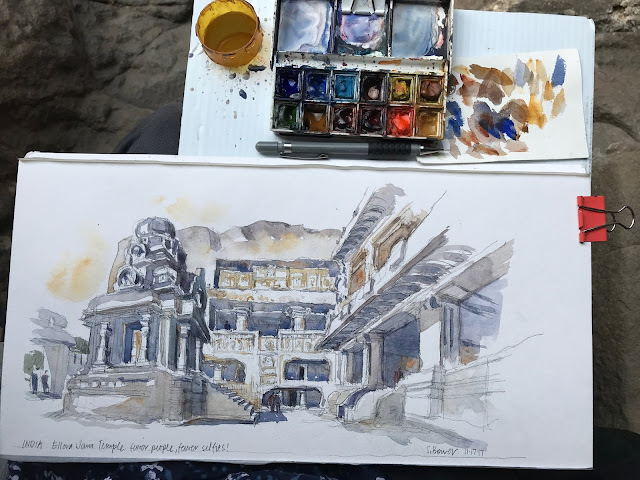 Those of you who have seen me work in person know that I like to use a tripod/easel and a hand-held palette (for lack of a better word) for painting on location. I've found the easel is essential when I teach, so that people can better see what I'm doing (thanks to the workshop participant years ago who suggested this!) This invention came about after seeing variations on what other sketchers had, so I came up with my own version that uses a medicine bottle...it works great! It's approximately 7.5" x 6.5" and cut from corrugated plastic. In India, however, I was not permitted to take the easel into a lot of the famous architectural sites. As luck would have it, right before I left, I happened to make a larger surface to use. I can still attach my paints, paper and water, but it sits in my lap! I found it worked pretty well, so now I carry it with me when I go out to sketch--its lighter than the easel, which is great. The size is 12" x 15"--the largest I could make that fit in my backpack.The only trick is remembering to slant it a bit when painting! Here are the two versions I now use...the older tried and true hand-held palette, and the newer lap version...what do you think? At the AMAZING Ellora Caves in Aurangabad, India. In Rome, June 2017, with the talented Kelly Medford. In Italy last May 2017, during the Draw Civita workshop. Thank you, Vanni, for this great photo!! On the grass at an important Buddhist site in Sarnath, India, 2017. All these methods work great, depending on the situation. Have you tried any of these palettes? Exactly three weeks from now, I will be arriving in HONG KONG! Yes, a good pinching is needed. For this trip, I'll spend 3 days or so in HK (and will get to sketch with the incredible Rob Sketcherman), then fly to Taiwan to teach at an Asian Urban Sketchers symposium called AsiaLink. It's held this in year in Taichung. I am thrilled beyond words, and have to thank the amazing KK for this opportunity. Will be GREAT to see the Aussie contingent! 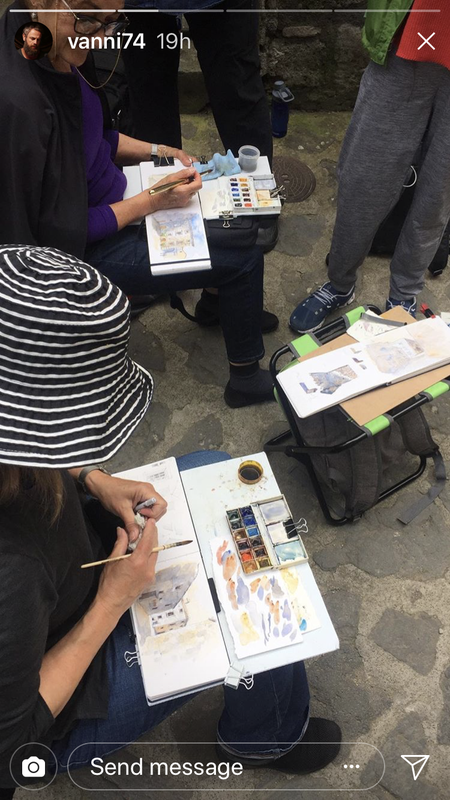 After a week in Taiwan, I'll meet my husband in Japan and hopefully see Kumi and other Japan Urban Sketchers as well. I need help with some colors, and in particular RED. I hear the reds look different in person when compared to photos, and the reds in HK will be different from the reds in Japan. Whew! 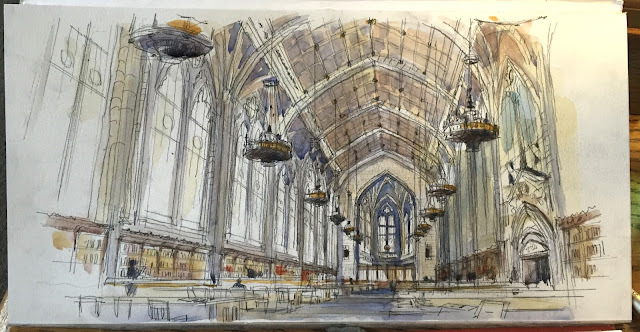 Seattle Urban Sketcher Tina Koyama suggested vermillion, and Steve Gallisdorfer from ColArt/Winsor & Newton suggested WN Scarlet Lake. Amazingly, they are both very similar colors! I showed the color test to our Japanese friend Naoe, and she picked the same color, so right on, Tina and Steve! I'll also need a bluer red, and I'm thinking about Pyrrol Red. Of course, any of these reds could be tweaked a bit if needed, but as it's a pure primary color, I need to try to hit it right on the nose. So, anyone been to these countries and have a good red to recommend??? Browsing through television offerings two nights ago, I was shocked to stumble upon this...oh my gosh!!!! I suppose it makes sense, as Craftsy was sold to NBC/Universal (parent company Comcast), so of course there would start to be integration with TV somehow. But still, what an amazing surprise! Going forward, the Craftsy Unlimited (subscription) service is becoming Bluprint, with an expanded content of 3,000-plus hours of instructional videos (including courses by Shari Blaukopf, Marc Taro Holmes, Suhita Shirodkar, and Paul Heaston, and more. Craftsy.com will still exist for a la carte classes, so you won't lose whatever you have already purchased. Bluprint is offering a free 7-day trial ...that means you can watch limitless classes on photography (like iPhone tips), cooking (like Indian curries), baking, knitting, quilting, and of course, sketching! To sign up for the trial, use this link. 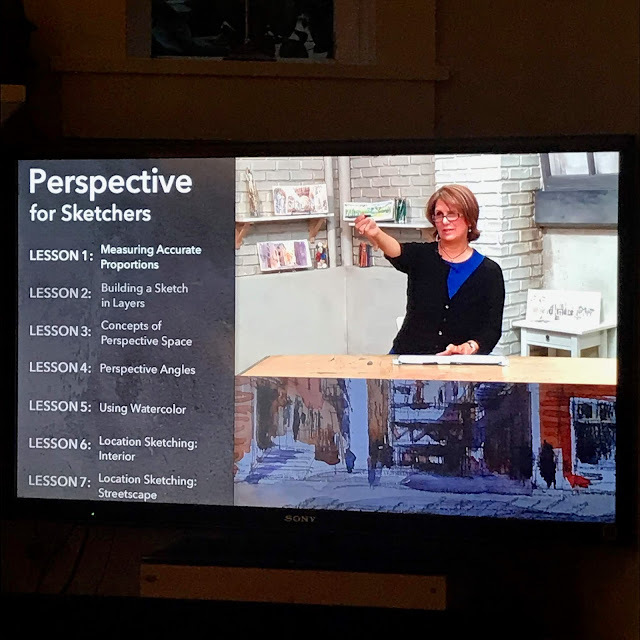 My Perspective for Sketchers class launched nearly 3 years ago, and I still answer questions and comments that are posted. It's proven to be an amazing experience, as I hear from people all over the world. Thanks to Craftsy for this amazing opportunity to demystify perspective and spread the joy of sketching! Every summer, I teach a workshop in the tiny speck of a town, Civita di Bagnoregio in Italy. This year it was unusually cold and rainy, so one morning I just sat down to sketch the interior of the tiny apartment where I stay. Tile floors, tile ceiling, huge chestnut wood timbers...it has the feel of an Italian farm house, as it sits in the middle of a garden and is appropriately called, Il Giardino. but he must love this sketch as it is now pinned on his bedroom door. That's my father-in-law in the kitchen making bread. And this is the apartment in The Hague of my aunt and uncle. I love the feel of the room, all the things from Chile where my aunt and mother grew up, and that spectacular view out their window. Feels like home. 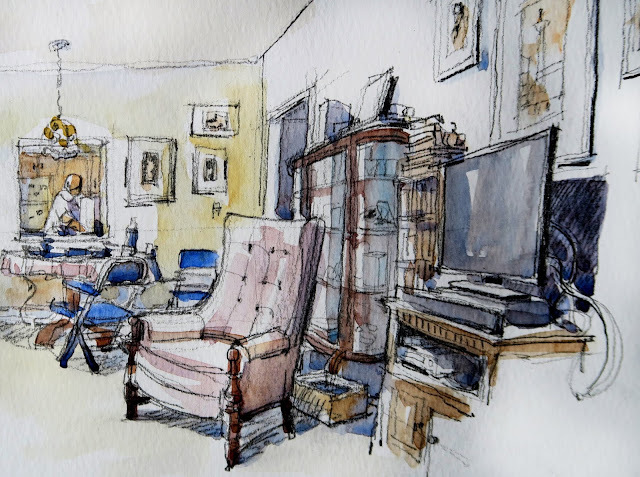 This sketch is framed and hangs on their wall. In my workshops, I often talk about starting a sketch with either the SHAPE OF THE FACE, or the SHAPE OF THE SPACE. 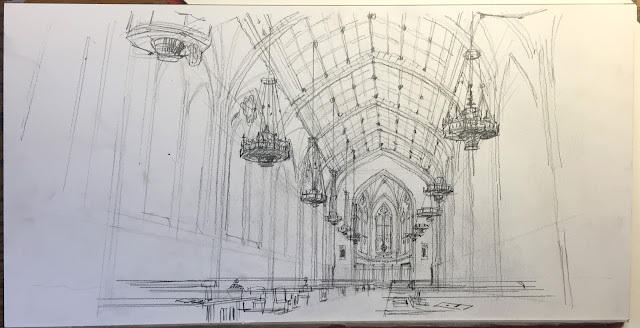 With all three interior views, I start with the latter...you can see below the rectangle I used to start this sketch, curved a bit for a wide-angle effect. Then comes the VP and the Eye Level Line...can you find those? And can you find the shape I start with in the other two sketches???? TIP 10/10: Domes are ROUND! And here is the final post in this series of 10 TIPS! 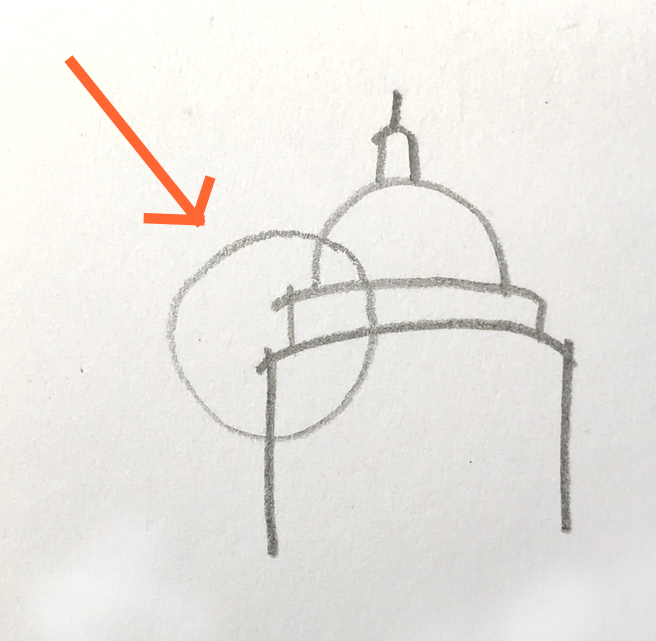 Sketching Tip #10: Domes are ROUND! 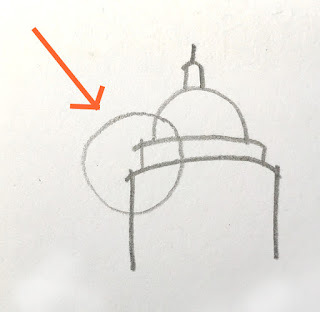 This may seem rather obvious, but I see so many sketchers draw domes as sort of flattened out the shapes in which the "edges" are drawn as if they were sharp corners instead of rounded. You'll notice that this building, similar to a dome, is a stack of ellipses in perspective. very top of the dome with the center of the footprint of the building on the ground. You'll also notice that each ellipse gets FLATTER the closer it is to your eye level line. Understanding this concept points out why the diagram of the flattened dome with "corners" is incorrect, and the rounded dome edge below works much better! Domes don't have sharp corners!! you can see the shape of the ellipse starting to curve behind the building. And here is the completed sketch! You can see and feel the roundedness of the forms, especially by looking at the rounded "edges". I hope you have enjoyed and learned a bit from these 10 blog posts! I will continue to post tips and more sketches, so please sign up to receive these posts by email using the sign up on the bar on the right. And if you want to learn in person, I'll be teaching workshops next year in Spain and Italy...and more places too! 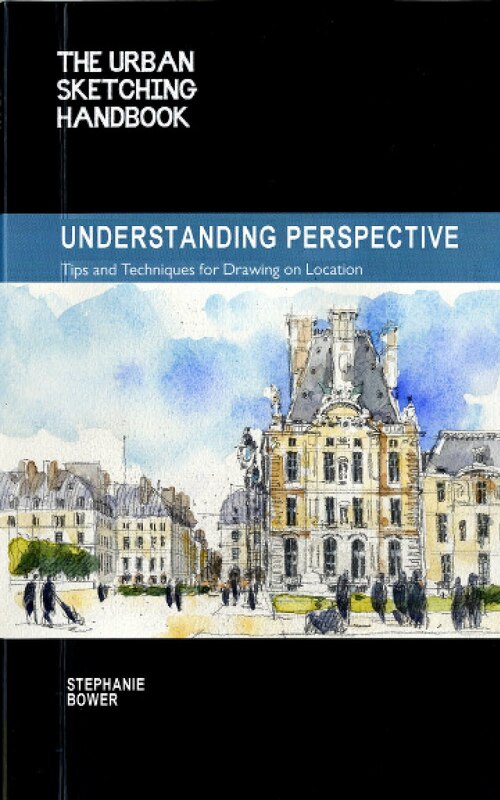 The Urban Sketching Handbook: Understanding Perspective. Thank you so much for your interest, and Happy Sketching! I often see sketches in which arches look more like horseshoes than real arches! 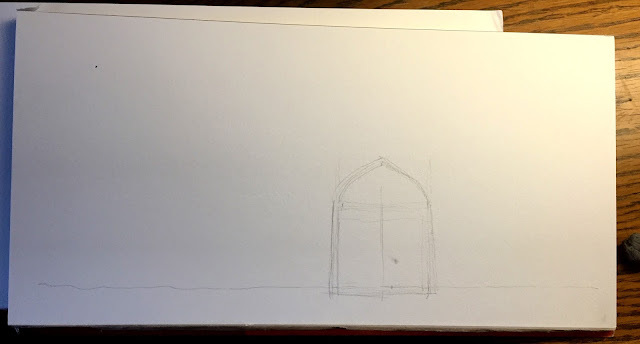 So to help you draw an arch that looks like an arch, here are some tips. I start every sketch I do with what I call "Good Bones" or the foundation lines drawn lightly onto my paper. This way I can mess up or easily erase as needed, and I can establish early on what my sketch will look like. 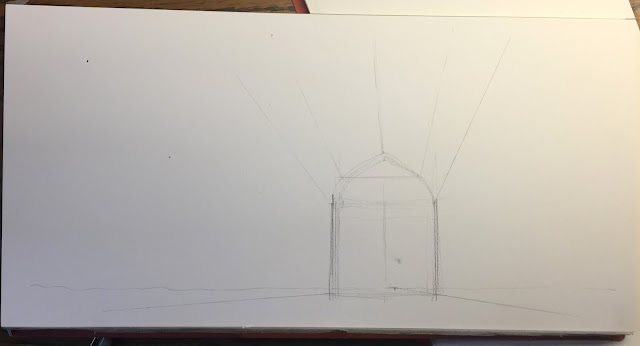 In the sketch below, you'll see how I break down the shapes of a simple arch. An arch has straight vertical legs (in red) up to a line called the "Spring Line" (in turquoise). 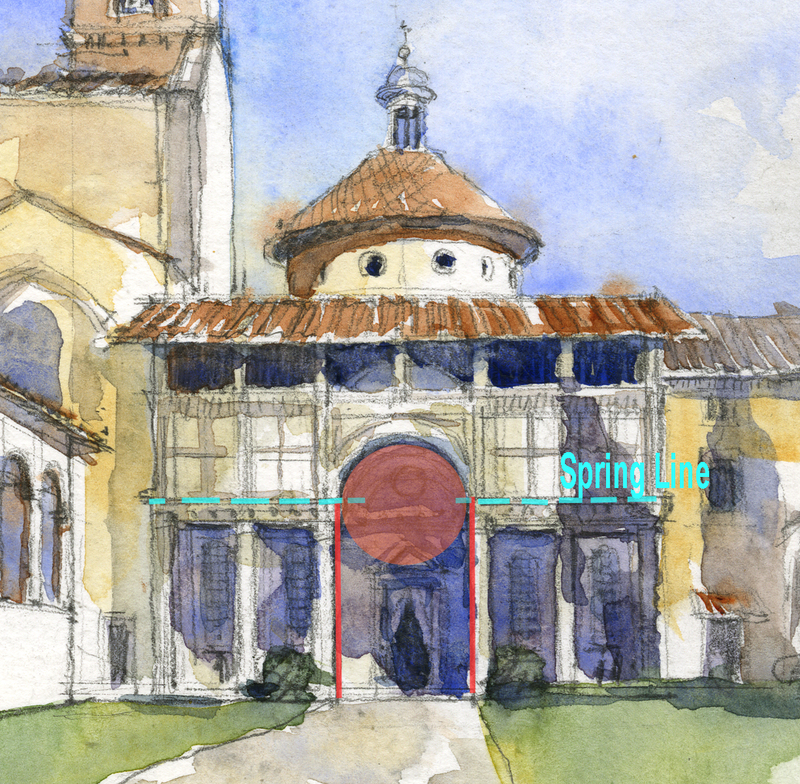 The spring line is where the curved part of the arch starts. The spring line is often called out with some type of decoration or moulding. And in a straight on view like this one, above the spring line, there is usually some form of a circle (in light orange). We are back at the beautiful Pazzi Chapel in Florence! And here is the analysis of an arch in a straight on view. You can see the vertical straight up and down legs on both sides, the SPRING LINE at which level the straight legs start to curve, and the circle I draw in lightly to help me get the correct curve of the arch! In Renaissance buildings like this, the arch is typically a true half circle. In other countries and in other time periods, you get different shapes. Now let's look at an arch from an angled view. The circle we see in a straight on view is now flattened to an ELLIPSE!!! 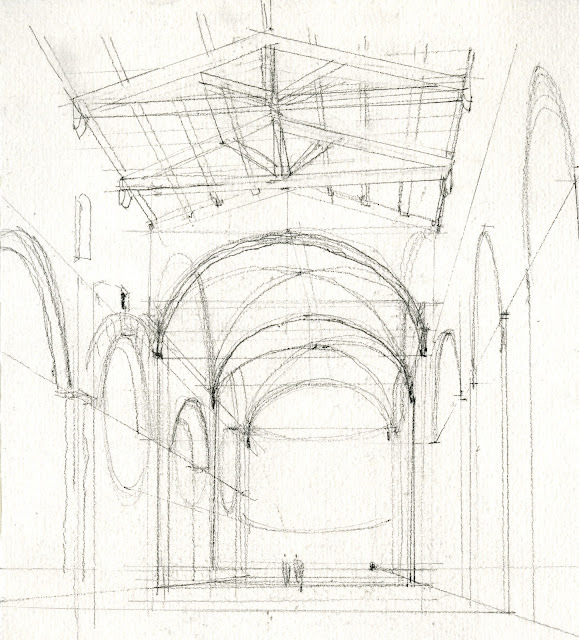 I draw this in lightly to help me get the correct shape of the arch--makes things so much easier! teach a workshop each summer! 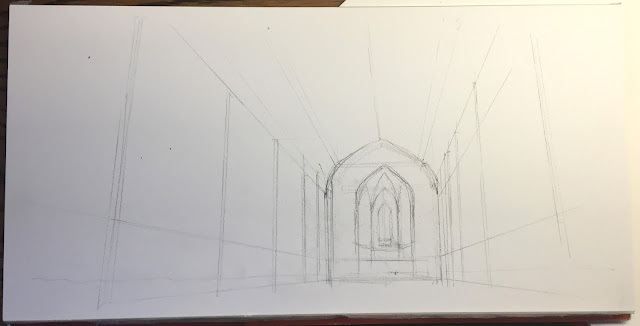 to establish the height of the arches, also going to my vanishing point. And to connect all the arches together at the same height, I add another guideline to establish the bottom of the ellipse. This helps me draw them at consistent heights. This all might look a little technical, but it's actually really easy. Just make sure you draw straight legs, then use a circle or ellipse to get the shape of the arch above the spring line! 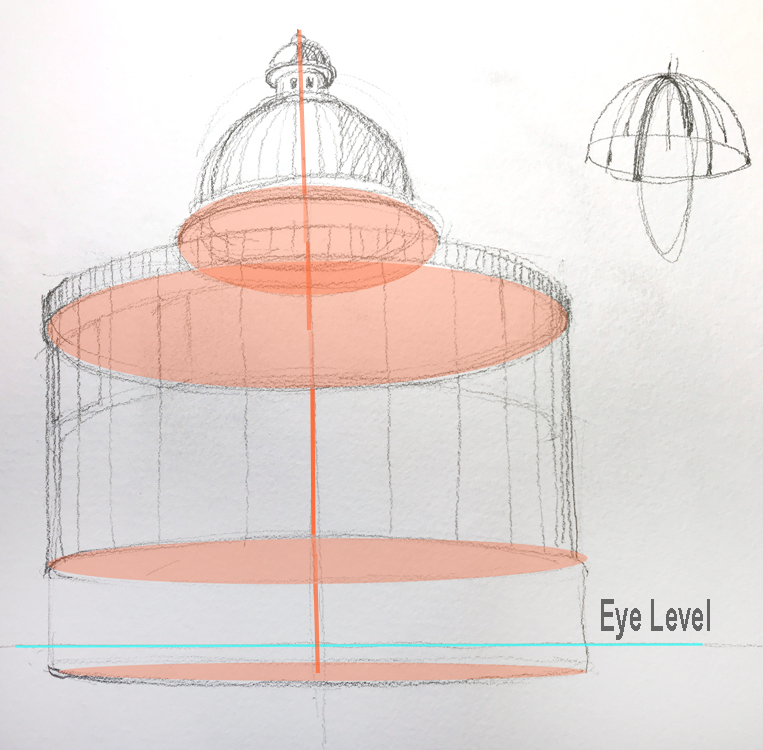 One more sketching tip to go in this series, and it will be on DOMES. If you like these posts, please sign up to receive my blog via email. 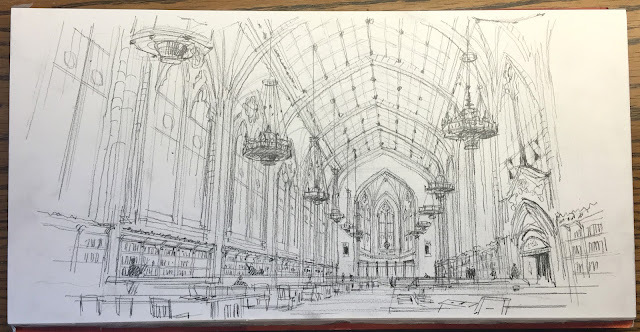 I will continue to post sketches, workshops, and even more sketching tips!